Michelle Cann appeared on From the Top Show 139 at age 18. Concert pianist Michelle Cann is a young artist with a deep musical commitment to performing a wide range of repertoire throughout the US and to bringing the arts to local communities. Michelle made her orchestral debut at age 14 and has since performed with various orchestras including the Florida Orchestra, the New Jersey Symphony Orchestra and the Cleveland Institute of Music Symphony Orchestra. Michelle appeared as guest soloist with the Knoxville Symphony where she performed Gershwin’s Rhapsody in Blue and Florence Price’s Concerto in One Movement. Recently, Michelle performed with members of the Los Angeles Philharmonic in its Green Umbrella Series at the Walt Disney Concert Hall in Los Angeles and, again, at the Barbican in London. She regularly appears in recital and as a chamber musician throughout the US, China and South Korea at premiere concert halls including the National Center for the Performing Arts in Beijing and the Kennedy Center for the Performing Arts, and recently performed a solo recital at the Bermuda Festival on the island of Bermuda. Michelle is under the management of Lisa Sapinkopf Artists. Michelle received her Bachelor and Master degrees in piano performance from the Cleveland Institute of Music studying with Paul Schenly and Daniel Shapiro and received an Artist Diploma from the Curtis Institute of Music in Philadelphia studying with Robert McDonald. Soon after, she was placed on the Curtis staff as one of the new Collaborative Staff Pianists. 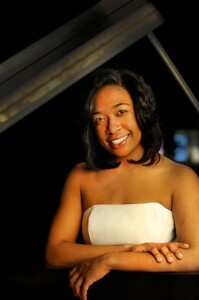 In addition, Michelle is on the faculty of the Luzerne Music Center as a Coordinator/Instructor of Piano. Her summer festival appearances include the Taos Chamber Music Festival, YellowBarn Chamber Music Festival, Perlman Music Program Chamber Music Festival, and most recently, Artist in Residence at Pianofest in the Hamptons. Michelle is a young leader in creating opportunities for music education in her community. During her time in Philadelphia, she has served as the choir director of two thirty-member children choruses in the El-Sistema inspired program, “Play On Philly”, and is the founder of a new program, “Keys to Connect”, which strives to strengthen the bond between parent and child through the shared study of piano. She served as one of three Curtis Institute of Music inaugural fellows of ArtistYear. Through that one year fellowship, Michelle worked with local community partners such as City Year, Teach for America and AmeriCorps to bring the arts to local Philadelphia communities where arts education and access are unattainable.